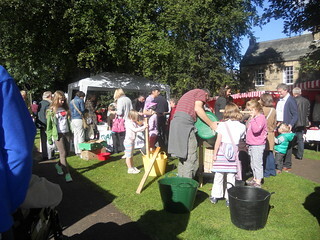 We all enjoyed the glorious weather for Hexham’s Eating Festival on Saturday, and with it plenty of freshly pressed apple juice, sourced from local apple trees, courtesy of the TT Apple Press. But thanks to everyone who asked their friends, and friends of friends, we managed to get an admirable yield come pressing day. Special thanks should go to Neil off the Sele, Gillian’s Dad and Wendy for their very generous donations. But we also had numerous gifts of single bags which amounted to a substantial amount in the end… and when the tree is virtually bare, one bag of apples is a lot! Thanks to all our volunteers (and their families) for helping throughout the day: Debbie, Roger and Jen, Wendy, Megan and Chris, Kat and Andy, Kate, and Phil. Not that the stall really needed much supervision. Parents and children alike were so keen to get stuck in that the stall really ran itself. There were plenty of comments about ‘child labour’, but they seemed to enjoy themselves. 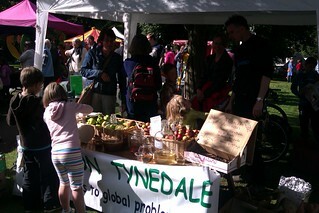 And with the best tasting apple juice in the country (probably) as a reward, I think it was well worth it.